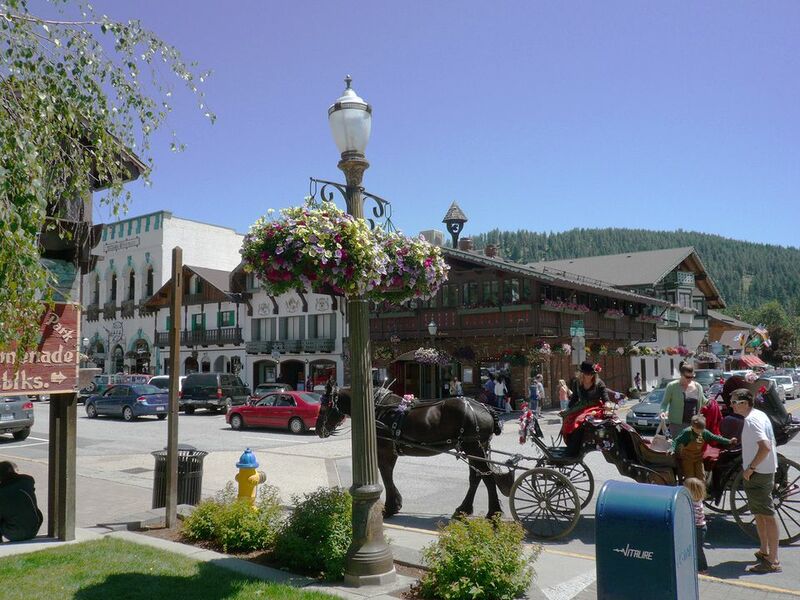 Leavenworth, Washington offers fun all year round. You can spend an afternoon wandering the shops and attractions in and around the central part of town. The surrounding mountains and rivers provide an opportunity for recreation in summer and in winter. Combine that with great food and fantastic festivals and you have the makings of a refreshing Northwest getaway. Here are our recommendations for fun things to do in Leavenworth. This fascinating, family-friendly museum features nutcrackers from around the world and throughout history. They have hundreds of the colorful wooden-character type of nutcracker, as well as a wide variety of other devices used to crack nuts. The Leavenworth Nutcracker Museum is open for just a few hours each afternoon during the warmer months, and on weekends only during the cold season. The entrance to the museum is located next door to the Nussknacker Haus, Leavenworth's nutcracker and collectible shop on Front Street. This 18-hole putting course is in a lovely green setting, complete with water features and mountain views. Kids of all ages will enjoy the family of goats that reside on the hillside adjacent to the course. Enzian Falls Championship Putting Course is located across Highway 2 from the Enzian Inn. The putting course is open during the warmer months of the year. Located just a short drive from town, the Leavenworth National Fish Hatchery is worth a visit for a number of reasons. You can check out the fishery exhibits in the main building and then take a walking tour of the hatchery facilities. The hatchery's flat-and-easy nature trail takes you along Icicle Creek, where you can observe a variety of flora and fauna. The fish hatchery also has nicely landscaped grounds where you can enjoy a picnic or a romp with the kids. Leavenworth is certainly a festival town. Almost everything is a reason to celebrate, from ice to beer to autumn leaves. Here are some of Leavenworth's popular annual events and festivals. Leavenworth is a prime spot on the Great Washington State Birding Trail. Fishing, camping, mountain biking, golfing, and climbing are other outdoor activities you can enjoy during the summer in Leavenworth. You can also check with the NFS ranger station in Leavenworth for current conditions and recommendations. During the winter, Leavenworth offers the full range of snow sports. Abundant snow and sunshine make the Leavenworth area great for both downhill and cross-country skiing. In addition to the local ski hill, there are two major ski resorts within an easy driving distance of Leavenworth, making it a great base for a winter vacation. Leavenworth Ski Hill - Operated by the Leavenworth Winter Sports Club, this facility has two groomed ski hills served by rope tows. Snow tubing sessions are available at the LT Michael Adams Tubing Park. Mission Ridge Ski & Board Resort - Mission Ridge offers challenging skiing, lodging, and resort amenities. Stevens Pass - You'll find skiing and snowboarding terrain for all skill levels. Lessons and gear rentals are also available. Leavenworth Nordic Trail System - The Leavenworth Winter Sports Club maintains trails for cross-country skiing at four different locations around Leavenworth, including the golf course, Waterfront Park, and the Ski Hill. Okanogan-Wenatchee National Forest - The nearby national forest offers a variety of different recreation opportunities each winter. Snowmobiling, snowshoeing, and Nordic skiing are among the winter sports you can enjoy within the Okanogan-Wenatchee National Forest. Leavenworth provides a variety of different shops for its visitors. While many clearly target tourists, there are some shops that offer quality art, home furnishings, and clothing. Here are some of the Leavenworth shops that stand out. This nutcracker and collectible store offers nutcrackers of all kinds, qualities, and sizes. If you're looking for a unique gift for a special someone, you might just find it at this clever shop. Leavenworth's Nutcracker Museum is located above the shop. This basement shop specializes in cheeses from around the world. You'll also find a variety of gourmet foods, wine, and beer. It's Christmas all year at this merry shop, where you'll find the full range of decorations and collectibles. Department 56, Christopher Radko, and Mark Roberts are among the product lines they carry at Kris Kringl. A frivolous weekend needs a silly hat and you'll find plenty at this Leavenworth favorite. They carry some fashionable and practical hats as well. The pet boutique carries everything you might need to care for and spoil your precious canine companions. Enjoy German food? Leavenworth is the place for you. You'll also find restaurants serving other cuisines, including Southwest, Thai, Chinese, and Italian. For fine Bavarian dining, try Cafe Mozart. Their schnitzels are incredibly tasty. They also have an award-winning selection of wines and yummy desserts. This basement restaurant welcomes you with a festive atmosphere, including live German music and the scent of sauerkraut wafting from the kitchen. Gustav's offers a more casual, pub-style setting. Their bratwurst is awesome - highly recommended. South offers tasty and fresh Latin- and Caribbean-influenced dishes. When you're ready for a break from shopping, The Gingerbread Factory is a charming place to stop for an espresso and a freshly baked gingerbread cookie. They also serve a variety of other bakery items, soups, and sandwiches. While beer is the first beverage that comes to mind when you think of a Bavarian-themed town, Leavenworth is actually a hot spot for wine lovers. There are several wine tasting rooms in town and you don't have to drive far to visit wineries. 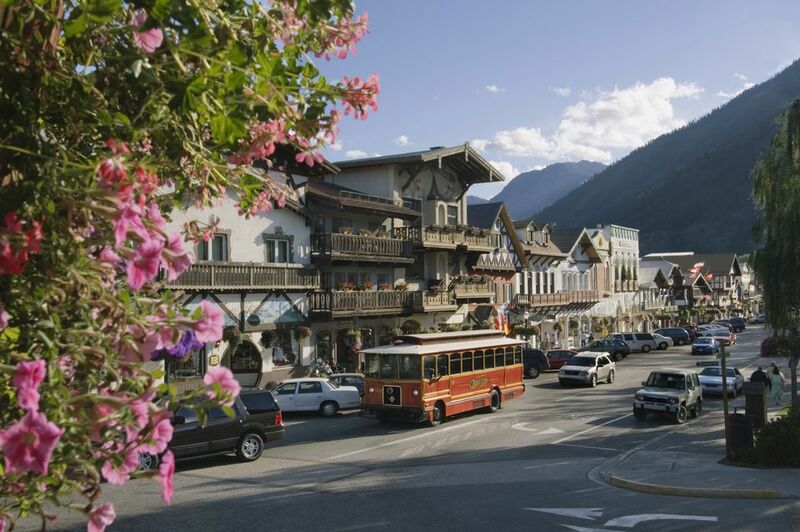 Leavenworth offers an array of lodging choices for visitors. Most of Leavenworth's hotels, like the town, are Bavarian-themed. This Leavenworth bed and breakfast inn is the perfect choice for a memorable romantic getaway. The rooms are tastefully and luxuriously appointed, with jetted tubs, gas fireplaces, and private decks with forest views. Each room is filled with thoughtful touches such as birding books, binoculars, bath salts, and throw blankets. In the morning you'll enjoy a full, multi-course breakfast in Run of the River's gracious breakfast room. Guests at the Sleeping Lady Resort, located down the road from the Fish Hatchery along Icicle Creek, will enjoy upscale rooms and gourmet food, all in a peaceful forest setting. Around the grounds, you'll find wonderful artwork, an organic garden, recreations facilities, and the Solstice Spa. Leavenworth's Icicle Inn offers an abundance of family-friendly features, including a miniature golf course, an enclosed pool, and an arcade. The guest rooms feature all the modern amenities you expect in a Best Western, such as Internet access and cable TV. Meeting facilities, a spa, and a breakfast buffet are among the other facilities and services available at Icicle Inn. Convenient to Leavenworth's central shopping and restaurant district, Enzian Inn provides several unique amenities. Guests can enjoy a free round of golf at the Enzian Falls Championship Putting Course, located across the highway. In the morning, a breakfast buffet is served in the Enzian's spacious breakfast room. During breakfast, you might be able to enjoy an alphorn performance. This hotel offers a view of the mountains and a special European breakfast. The Alpenrose has a great antique-filled guest salon and serves a full European breakfast. There are a number of fun attractions within a short drive of Leavenworth. Smallwood's Harvest is a fabulous farmstand, located just east of Leavenworth on Highway 2. The family-friendly activities at Smallwood's include a petting farm, a cow train, and hay rides. The country store offers just about every kind of sauce, jam, preserve, syrup, or jelly that you can imagine, as well as produce, ice cream, candies, and wine. Aplets and Cotlets are some of the tastiest treats available from the Northwest - and they're all made at the Liberty Orchards factory in Cashmere, Washington. Their free factory tour takes about 15 minutes and you'll see how they cook, coat, cut, and package their tasty fruit candies. After the tour, enjoy free samples in their gift shop. Cashmere's history museum has an amazing collection of stone tools from Native cultures in both the Northwest and Meso-America. You'll also find exhibits covering local human and natural history. The Pioneer Village features 20 different historic buildings, including a train station, a doctor and dentist shop, an assay office, a general store, a sheriff office and jail, and a millenary shop. By bar: Leavenworth is located on the east side of Washington's Cascade Mountain range, along Highway 2. It can be reached from the west via Highway 2 over Stevens Pass, or from the south via Highway 97, or from the east by traveling through Wenatchee. By bus: Greyhound offers limited bus service to Leavenworth. By train: Leavenworth is now a stop along Amtrak's Empire Builder route. Caution: Be sure to pack chains and check the road conditions and pass reports prior to winter travel.